As you can see I am a little addicted to these door tags. I am not even sure what I am going to do with them, maybe a trade or just give as little stocking stuffers at Christmas, but, I have had this idea in my head for ages. I was making myself laugh the whole time making this but it wasn't as easy as it looks. I first tried to make a texture template for the background. As you can see I wanted to make a card theme. The template was made of chipboard as I read how to make one in Stamper's Sampler magazine but I think the chipboard was not thick enough as it all flattened out in the Cuttlebug. So what to do, well I made a stencil instead and then put my paper over the stencil and basically did a dry emboss. So then I took the stencil and placed it back over the raised edges and inked the clubs, diamonds etc. in alternating black and red. I then inked the whole tag in java ink. I found a toilet line drawing online, I had to edit the baby boy then printed him out and coloured his towel around him with pencil crayons. Stamped and embossed in gold a crown for his head. I found a Royal Flush card graphic online and printed out my letters and put it all together. If you want to check out Jeanie's door challenge just click on the door tag to the right of the screen and it will take you directly to the post of how to do the challenge. 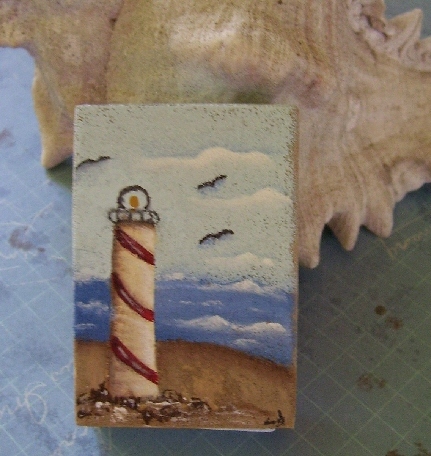 Next is a matchbox I have had made forever for the Vintage Dragon Fly's FlickR group. Our next swap is Treasures of the Sea. I covered my matchbox in a fine grit light coloured sand paper then painted the sea scene in acrylic paints. This was totally freehand. I think I did pretty good and finding sea items to fill the box was a bit of a challenge but I think Anna of Frosted Petunias will like it. I recently heard at the Post Office there may be a strike starting sometime next week unless things are settled before then so I need to get my swaps and items out by Tues. Monday is a holiday here in Canada, Victoria Day so needless to say everything will be closed. Hope you all have a wonderful and creative weekend. Love the door tag and the matchbox,both are really cute! Beautiful work Les! I know Anna will love her treasure of the sea! I am addicted to tags like you are to door hangers! I love your artwork on the matchbox. And the sense of humor on the door tag has me chuckling away quietly to myself too! Gosh you really are brilliant, these are so beautiful. i love the teensy details ... brilliant !! Lesley, your door hangar is adorable, and your teeny tiny matchbox painting is amazing!! How cute is your door hanger Les!! Love your sense of fun!! ...But I must say that the matcbox is stunning!Your beautiful miniature painting is so detailed! Your swap partner is a lucky gal!! Perfect for the bathroom door!